Euro 2008 kicks off this weekend and promises some intriguing group stage encounters (not least Holland v. Italy, Holland v. France, France v. Italy, Spain v. Russia, Czech Republic v. Portugal, and Germany v. Croatia). 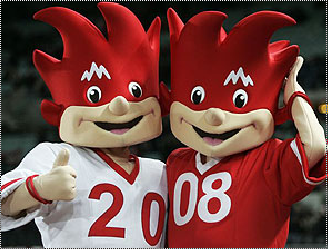 And the games can only get better in the following knock-out stages. Sometimes it is argued that this competition is stronger than the World Cup, insofar as the weather tends to be kinder both on players and pitches, and there are fewer weaker teams. 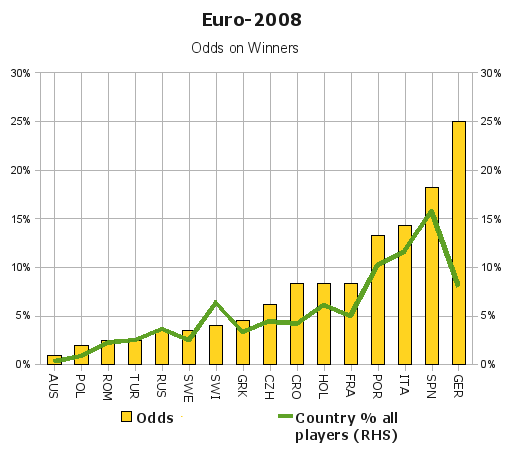 In the betting, Italy, the current World Cup holders, are rated behind Germany and Spain, but this a competition that has a habit of producing unexpected winners – for example the Czechs (1976), Denmark (1992) and Greece – the current Cup holders – (2004). Part of me is backing Spain, part takes refuge in Eduardo Galeano’s sentiments (post) that it is enough to enjoy the game. The reason that I’m cheering on the Spanish is, of course, that none of the British representatives have made it to the Euro 2008 finals, in the year in which two English teams contested the UEFA Champions League final and Rangers reached the UEFA Cup Final, and when 13% of the players taking part in Euro 2008 practice their trade in the Premiership. Of the 16 nations competing, only Italy & Russia do not have at least one current Premiership player in their squads. The globalisation of professional football is largely the consequence of the EU’s regulations on the free movement of labour: no amount of posturing by UEFA on the numbers of home players per team is going to be successful. Ironically in the Champions League final both Chelsea and Manchester Utd fulfilled Blatter’s ‘six-plus-five’ principle (which would limit a team’s “foreign” players to five). 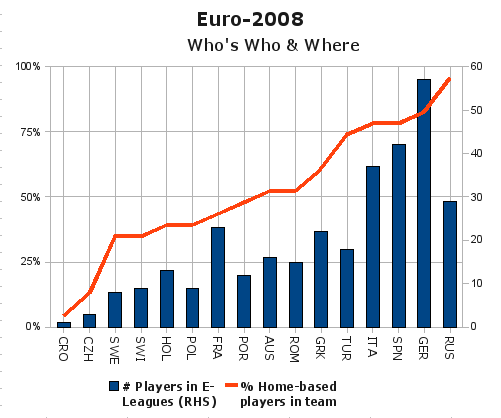 The number of home-based players in each nation’s squads is shown the graph, and is contrasted with the number of all players in each country’s domestic leagues: 96% of Russia’s squad play in their domestic clubs (and 8% of all the players in the tournament play in Russia), whereas only one Croatian plays in Croatia (and no one else does). Unsurprisingly the big football nations – Germany, Italy, France & Spain – have a high percentage of domestically-based squad members as well as sharing a large proportion of foreign players in their respective leagues [Data source: BBC]. Will this make any difference to their chances of success? The second graph contrasts the current odds (from William Hill: 4-1 Germany; 11-2 Spain; 7-1 Italy, Portugal; 15-2 France; 12-1 Croatia, Holland; 16-1 Czech Republic; 22-1 Greece; 25-1 Switzerland; 28-1 Russia, Sweden; 40-1 Romania, Turkey; 50-1 Poland; 100-1 Austria) with the number of players in the finals who play in each nation’s leagues (thereby assuming that this is an indicator of performance). The relationship looks quite close – without getting drawn into any statistical tests – but the actual results are likely to depend upon the players’ form and the quality of management. Let us remember that during qualifying England made the fundamental error of promoting the #2: see post No Easy Matches. The Premiership is probably the most international league in the world (in terms not only of players, but also sponsorship, worldwide tv coverage), and yet the overwhelming majority of the England team would most likely be drawn from the top four clubs (less if Arsenal is one of these). The question then – accepting the positive impacts of globalisation on British football – is how sustainable is the modern game given the clubs’ level of indebtedness and cost structures, and arguably the increasing inequalities between clubs, and the lower divisions. The issues is not about players’ nationalities, but rather the linkages between the advantages of globalisation and ensuring that domestic football can generate new talent and decent national teams (i.e the financing of domestic football, benefit-sharing arrangements and the “rules of the game” in the widest sense). Perhaps this is where the Germans, Italians, Spanish & French are doing better?